Season opener of football action between Sacred Heart University and Stetson in Fairfield, Conn. on Saturday Sept. 2, 2017. 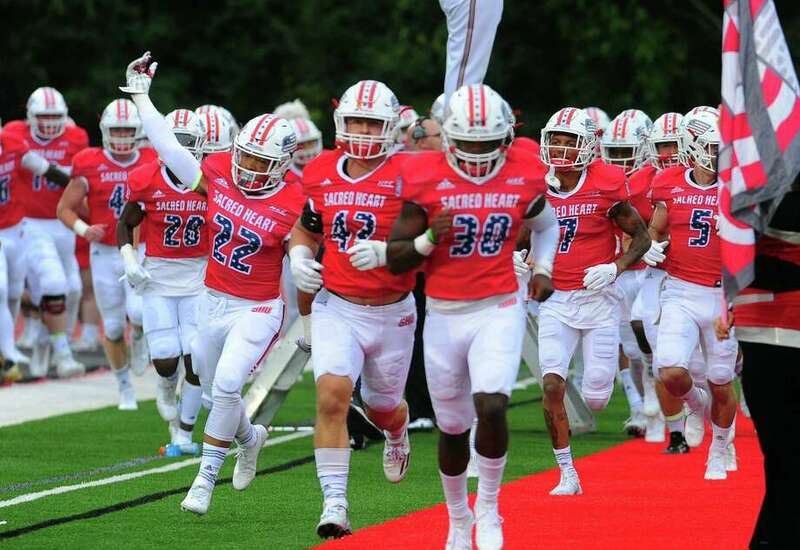 EAST RUTHERFORD, N.J. — Given the wealth of talent the Sacred Heart University football team lost to injury last season, no one would fault Mark Nofri and Co. if they felt a bit snakebit. Yet, somewhere along their 65-mile drive to MetLife Stadium on Tuesday morning for the Northeast Conference’s Social Media Day, two of the Pioneers’ most indispensable players, quarterback Kevin Duke and wide receiver Andrew O’Neill, shared their beliefs that this year could be different. “We were just talking, we’ve got a lot of depth at some positions,” Duke said. And then came the elephant in the car. It’s just that some teams are better equipped to handle injuries than others. Nofri, who has produced winning records in four of his six seasons as head coach, is hopeful that enough younger players will be ready to step up this fall to help the Pioneers counteract the injury bug. Perhaps they could also use some better luck. To recap: All-Northeast Conference linebacker CJ Parvelus and safety Alec Finelli missed time with concussions. Cornerback Shawn Ramcheran tore his ACL. Defensive tackle Bobby Steffe broke his arm. Running back Ose Imeokparia hurt his shoulder. The Pioneers stumbled to a 4-7 finish. Were the Pioneers victims of bad luck? Looking back on it, Nofri insists there’s nothing his team could have done differently to prevent those injuries. The good news for the Pioneers is that they can now turn their attention toward the future. They’ll do so, however, with only three starters back on defense and six returning on offense, including a pair of fifth-year seniors in Duke and O’Neill. Expectations on the outside are low. Sacred Heart was picked to finish sixth in the NEC preseason poll and did not have a single player named to the league’s all-preseason team. Of course, predictions will mean next to nothing when the Pioneers kick off their season Sept. 1 against Lafayette at home. Nofri talked Tuesday about needing to get more production in the secondary from Josh Turner and Alaam and Salaam Horne. He spoke glowingly about outside linebacker Kevin Sears and sounded optimistic about the offensive line, including Knikeem Lewis and former Brien McMahon standout Andrew Starr. He’s confident in running backs Eli Terry and Jordan Meachum. Nofri wants the Pioneers to be smarter and more disciplined on both sides of the ball. Last year was the first time in five seasons that the Pioneers finished with more turnovers than takeaways. Nofri said they were too “careless with the ball,” but refused to point fingers. Nevertheless, Duke, who passed for 2,596 yards, 15 touchdowns and 13 interceptions last season, took the blame. They hope the wins will come as well.